How would you describe 2017 in just two words? This is the type of reflective question that pervades the end of each year. Right after Christmas and just before New Year’s Day everyone is reflective. Honestly though, how would you describe your 2017 in a nutshell using just two words? Before you answer let me share mine. For me, in 2017 I saw in more ways than one that I am “truly blessed”. Looking back it is almost difficult to think about everything that transpired. There is so much to recap that I could go on forever. Thankfully much of my year directing 540WMain has been captured here on the website as well as on our Facebook and Instagram pages. Still, it is always helpful to meditate and reflect on all the challenges, triumphs, good times, and tough moments that made the year run. In addition to blessings in abundance, this year was all about growth. Growth for me personally. Growth for me as the Executive Director of a non-profit. And certainly growth as an organization. The thing about growth is that growing as beautiful as it is; is not always fun or easy. Growing can be tough and this year I had my share of tough moments. They came by way of my chronic illness and quite literally pouring more of my heart, more of my soul, more of my energy, more of my time, and more of my resources into this seedling of an organization. But guess what? I saw the growth. Even though I had to look closely at times (and in the face of overwhelming odds) this grassroots organization grew by leaps and bounds. Growth by way of blessings. Growth by way of community support. Growth by way of donations (one just came in as I edit this post). All of this growth when pooled together took 540WMain Learning Academy to a level that I never imagined we would see. This growth didn’t always come when I wanted it to come but the growth, like blessings always came on time. As I shared on Facebook; organizations like the Henrietta United Church of Christ blessed 540WMain. Community members like Doug Rice, Rawson Duckett, Jeff Frish, Sara Lynn Scott and so many others donated money, resources, time, and energy to our Courtyard Teaching Garden and our annual fundraising campaign. I was blessed to mentor an amazing cohort of interns for the second consecutive summer. I was blessed to put together an amazing board to help me carry out the mission 540WMain. 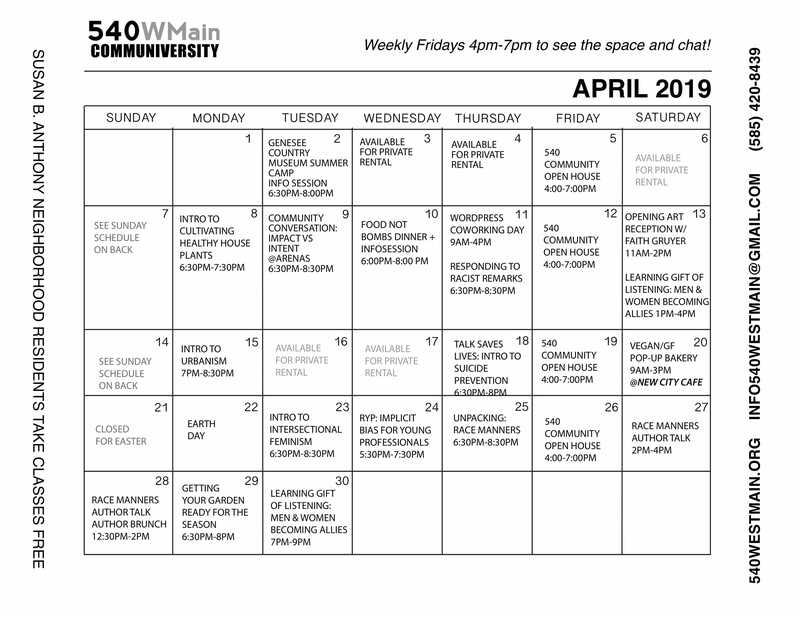 I was blessed to solidify 540WMain as a grassroots, non-profit community school and really take our programming and social media reach to another level. We hired a Marketing Assistant and 540WMain’s first paid interns came by way of 540’s annual Rochesterworks collaboration. The blessings truly abounded and I am thankful to recognize that every ounce of blood, sweat, tears, energy, time, more energy and of course monetary investment that I and all of you have poured into 540WMain is exactly the reason why 540 is still growing strong. In closing, I must reiterate that I make no personal income from directing 540WMain. 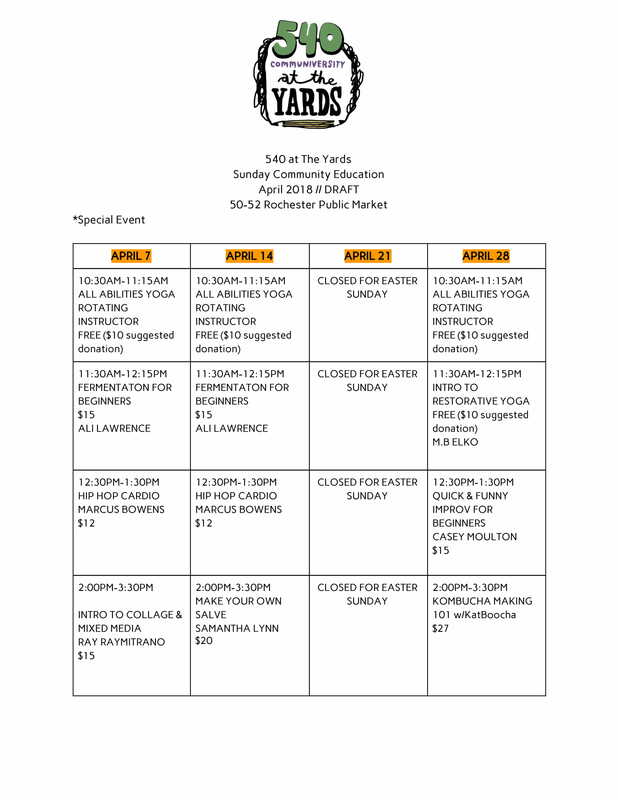 Every vendor fee course fee, and donation goes back into operating our space, creating more original programming and paying our interns and educators. The pot is not always full and when it isn’t I take from my personal pot to connect the dots. I say this not to brag, but to share my gratitude for the privilege of being able to give back and for the honor of seeing the good in people and a community that so often gets maligned, overlooked and frowned upon by the local media and (unfortunately) its own members. Thank you for blessing me to do this great work. During my darkest moments and hardest nights whenever I feel like giving up I remember that I am truly blessed in more ways than I can count. Thank you for blessing me to be able to do a work that I truly love. Thank you for helping 540WMain Grow. P.S. Don’t forget to comment how you would describe 2017 using two words only. I can’t wait to read your comments. OMG! Thank you Erin. This means so much!